Tired of paying High Electric Bills? Solar can eliminate your bill & its $0 Down to switch! It’s as easy as providing an Electric bill (upload here). By analyzing your last 12 months of electrical bills we will know exactly the size system you need. Helping Americans become energy independent is a service we take pride in. 15 KW System in Houston, TX. Certified professionals will conduct a site survey which includes a structural evaluation of the building to determine factors such as roof pitch and potential obstructions. Then we use the data from your previous electric bill to customize system options and maximize your profits. 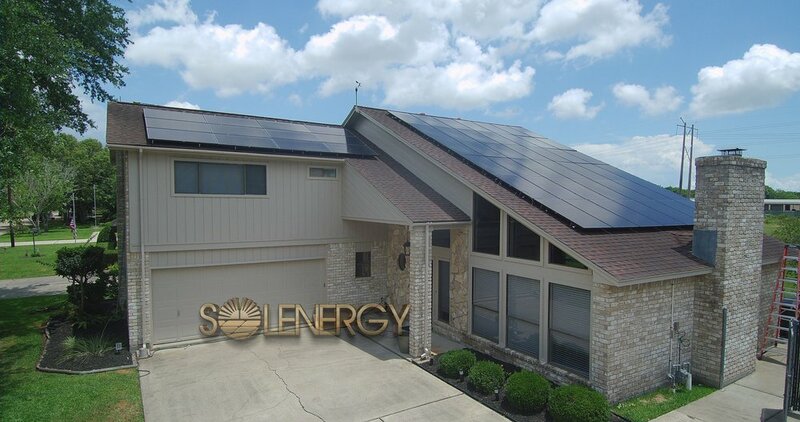 SolEnergy will design and install a custom system for your house, townhouse, multi-family units, parking areas, garages, barns, and ground-mount arrays. Solar Energy helps to reduce the harmful impact from greenhouse gases for the future of our children. 2 billion trees store as much carbon as the emissions reduced by the U.S. solar industry (seia.org). Sadly, air pollution is the leading environmental cause of death in the world. Most of this pollution is caused by the burning of fossil fuels to generate electricity. Solar energy can help reduce the harmful impact from greenhouse gases for the future of our children. The SunShot Initiative is a federal government program run by the US Department of Energy's Solar Energy Technologies Office. It bills itself as a national effort to support solar energy adoption in order to make solar energy affordable for all Americans. The initiative is a collaboration of private companies, universities, state and local governments, and nonprofits, as well as national laboratories. Monetizing the environmental health benefits of solar could add ~3.5¢/kWh to the value of solar energy (see Wiser et al. 2016). The monetary impacts due to environmental degradation and public health impacts seem far removed from the apparent “sticker price” of electricity. Yet quantifying these impacts is essential to understanding the true costs and benefits of solar and conventional generating technologies. Compared with fossil fuel generators, PV and CSP produce far lower lifecycle levels of greenhouse gas (GHG) emissions and harmful pollutants including fine particular matter (PM2.5), sulfur dioxide (SO2), and nitrogen oxides (NOx). Achieving the SunShot-level solar deployment targets—14% of U.S. electricity demand met by solar in 2030 and 27% in 2050—could reduce cumulative power-sector GHG emissions by 10% between 2015 and 2050, resulting in savings of $238–$252 billion. This is equivalent to 2.0–2.2 cents per kilowatt-hour of solar installed (¢/kWh-solar). Similarly, realizing these levels of solar deployment could reduce cumulative power-sector emissions of PM2.5 by 8%, SO2 by 9%, and NOx by 11% between 2015 and 2050. This could produce $167 billion in savings from lower future health and environmental damages, or 1.4¢/kWh-solar—while also preventing 25,000–59,000 premature deaths. To put this in perspective, the estimated 3.5¢/kWh-solar in benefits due to SunShot-level solar deployment is approximately equal to the additional LCOE reduction needed to make unsubsidized utility-scale solar competitive with conventional generators today. In addition, water savings from achieving the SunShot goals, could result in the 2015–2050 cumulative savings of 4% of total power-sector withdrawals and 9% of total power-sector consumption—a particularly important consideration for arid states where substantial solar will be deployed. Improving public health and the environment is but one aspect of solar’s many costs and benefits. Clearly, however, the assignment of value to such “external” impacts has potential implications for policy innovation and the economic competitiveness of solar and other generation technologies. SolEnergy aims to improve the efficiency in which people generate, share, and use electricity. Our current grid is outdated due to the constant issue of fuel shortages, power outages, transmission problems, increasing electricity costs, and hazardous effects from the chemical waste. Private corporations have had control of our energy grid for far too long. Most markets in the country are still regulated by only one company, also known as a monopoly. Luckily with Solar, you can produce your own electricity and even get paid for your excess energy on the grid. Envision a grid where everyone can share electricity with their solar panels and clean storage. Everyone can be involved in the buying, selling, and trading of electricity, all while strengthening the grid by decentralizing our power source. Texas Land Commissioner (George P. Bush) & SolEnergy Co-Founder Laurence Gibson discussing the benefits of Solar Energy in Texas.